Pierre Westie: “We have the perfect job for someone that enjoys cuddling puppies. 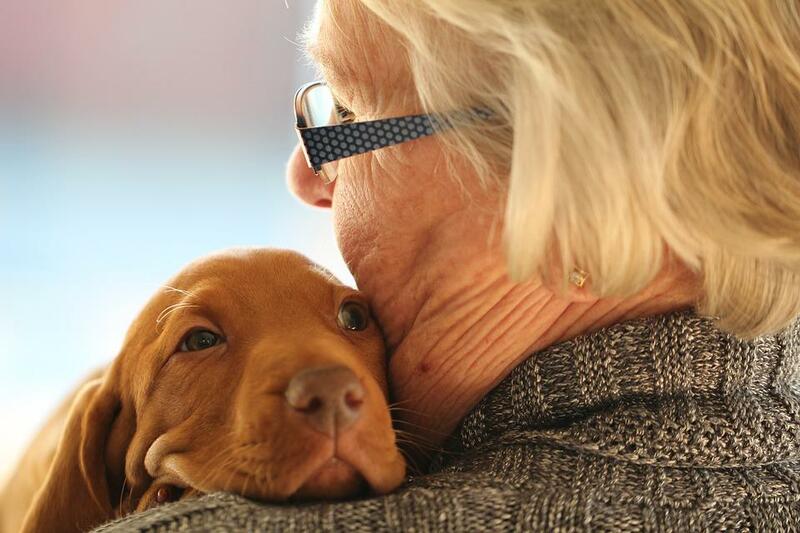 Mutts® Canine Cantina in Ft. Worth just offered a position to pet and cuddle puppies. The “puptern” would earn $100 per hour! Bentley: “This next story is filed under What were they thinking? A Seattle couple trying to bring their Bengal cats to Hawaii with them but have been denied. 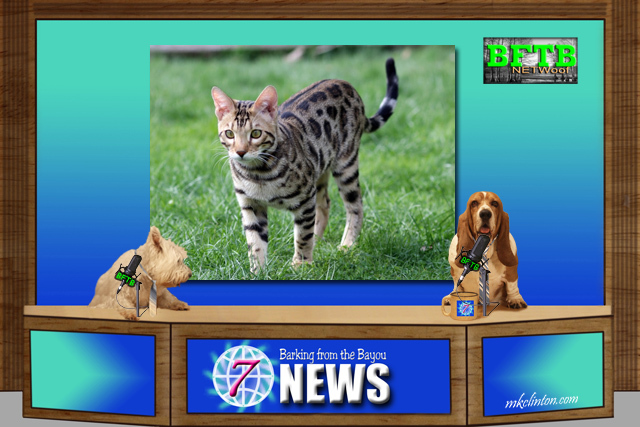 A Bengal cat is domestic but has markings like a leopard or ocelot. Pierre: “Speaking of the Department of Agriculture, they have made another ruling this time in Oklahoma. A man found a feral piglet on the road a year ago. The rest of its family had been run over so he decided to take the survivor home. They named her Felicia and she became a member of their family. Felicia escaped her yard not long ago and a complaint was filed. The family was told since it had become a family pet, they could keep her if she was spayed and tested for Brucellosis and Pseudorabies. These diseases are commonly found in feral swine and can infect humans and other species. The family has chosen to ignore those rules and the state has concluded that Felicia must be euthanized. 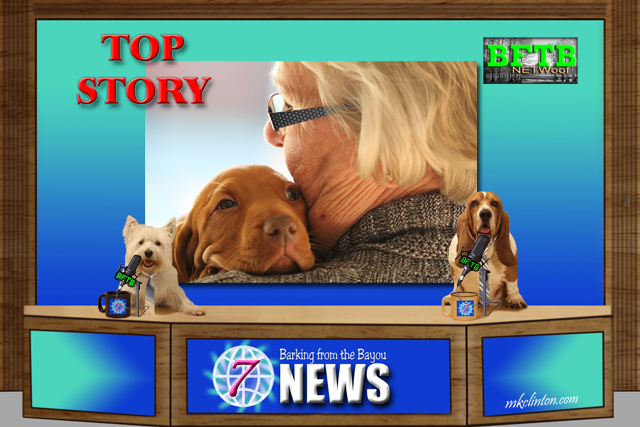 Pierre: “This next report was on one of our local news stations and was such a feel-good story that we wanted to share it. Worried animal lovers had been trying to rescue a couple of pups from a north Houston storm drain for several days. Finally, with rain and freezing temps forecasted, they decided it was time to do everything they could to locate the dogs and try to save them. The police and fire department had been out but could not locate them. With the cover open, two unlikely heroes showed up to lend a hand. Major League baseball pitcher for the Oakland A’s Daniel Mengden and 14x Ironman veteran Rick D’Amico went down into the hole and searched for over an hour before finding the cold and hungry puppies. The two men did not know each other before this but proved that teamwork is important on and off the field. The crowd erupted in cheers when they surfaced with the pups. 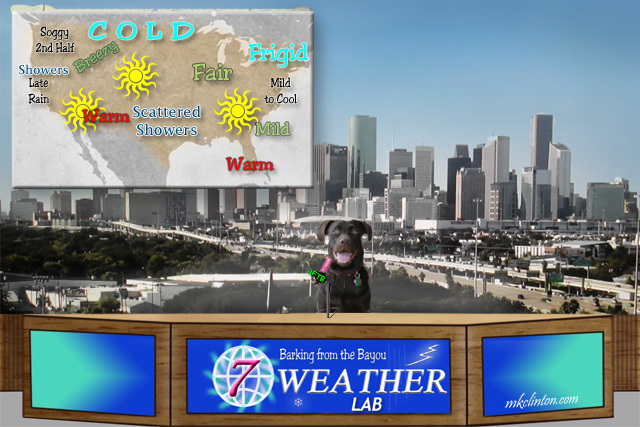 Paisley the Weather Lab: “I think we all have weather that we can be thankful for this week. Let me start with California where they are still battling those horrid wildfires. We are expecting showers to help douse some of the flames. SoCal will have rain later in the week. Please continue to pray for all those displaced including the wildlife. As we scan the map there is a hodge-podge of weather. Both the southwest and southeast will be sunny and warm. Here in Texas, there will be scattered showers with temperatures in the 70’s. The center of the U.S. will be breezy and sunny over the Rockies and fair all the way to the east coast. You will have cooler temps so a jacket before heading out to Thanksgiving dinner. Those of you in the north dealing with frigid weather. If you enjoy bundling up, this is going to be a perfect week. 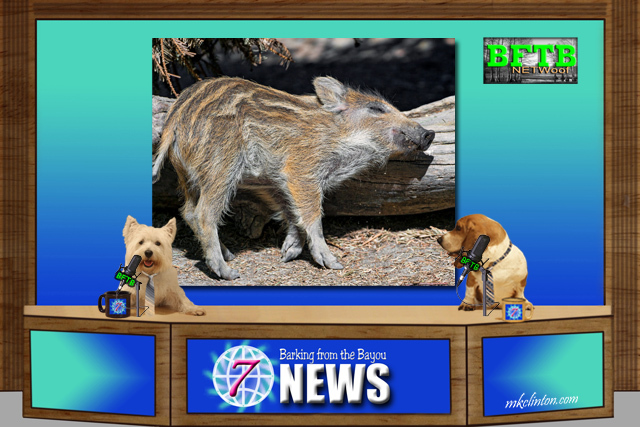 Bentley: “Yes, all of us here at BFTB News hope that you have a happy Thanksgiving. Please know that we are very thankful for all of you and the loving support we receive each day. This week will be hectic for everyone but we hope you will still stop by for some fun reviews, holiday tips, and the all-important Black Friday gift ideas! We are affiliates for the following companies. If you make a purchase through our links and/or use our discount code, we will receive a commission. Thank you for your support! Click on any of the ads below to be magically whisked away to online shopping and saving! Luckily, Fort Worth are a bit of a commute for my momma! My mom would be signing up to pet and cuddle puppies and she's do it for free! I finks my Mum would also like to join the cuddle queue as well! Bengal Cats are beautiful but I've seen them in action and let me just say they purrsonalities and stamina are like a 6 month old Domestic cat on 87 million mg of catnip!! I cannot imagine having one in the house. We are suspicious of the $100 to pet puppies. Is this for one hour a month? Ghostwriter says to send those puppies to the nursing home. The people there would love to cuddle and pet some pups for free! We hear there is a similar restaurant/dog park combo in Kansas City, but we haven't been there yet. We think it must be a very fun place, right? OMD...Mama says she wishes she could get a job as a puptern!! I hope that poor piggie doesn't have to be euthanized. I can't believe the family would let the piggie be euthanized. Bravo to the men who found the puppies! I can't believes the piglet story!!!! pfffffffft!!! I say to them! WTD??!! I hopes they come to their senses!!! geesh. $100 per hour to cuddle w/ puppies!? Are you sure you didn't mean $10 an hour? Sign me up for THAT! I feel terrible for the pig Felicia. Perhaps the family couldn't afford to meet the requirements? Other than that you're right, their "love" is hogwash. $100/hour to cuddle puppies?? Now that's my dream job! 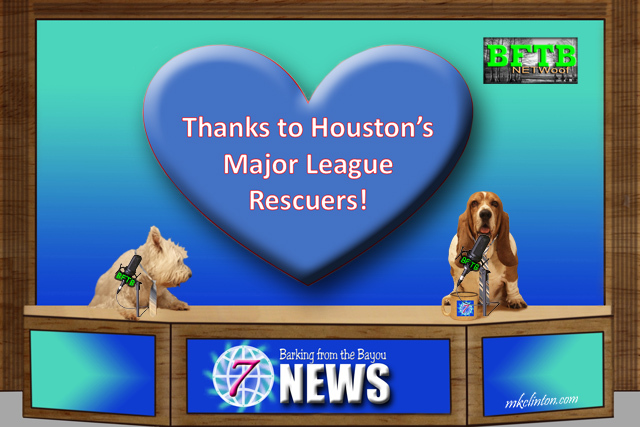 What an especially touching story about the pro athletes rescuing the pups! Bravo for them and the City of Houston.